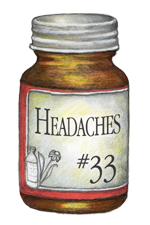 Luyties Headaches #33 is the natural homeopathic remedy that gives relief to diverse headache pains from many triggers: stress, colds, congestion, heat, PMS etc. This remedy is a combination of Aconite, Belladonna, Bryonia, Iris and Nux vom. If pain persists for long periods of time, it is recommended that you seek professional attention.